The final version of this article with its full bibliographical information is available. To access the article, click here (Vol. 82 (2018), No. 2 pp. 541-545). Background: Few studies have investigated the clinical impact of pulmonary artery (PA) dilatation on outcomes in pediatric pulmonary arterial hypertension (PAH). Methods and Results: This study investigated the clinical outcomes of idiopathic or heritable PAH in 66 children aged <18 years at diagnosis. Main PA/thorax (MPA/T) ratio was measured on chest radiography in PAH patients. Patients were divided into 2 groups based on MPA/T ratio, and compared with a control group of 166 age- and gender-matched healthy children. Group A had higher MPA/T ratio than normal, and group B had normal MPA/T ratio. Composite outcomes included cardiac death, lung transplantation, and hospitalization due to heart failure. Group A consisted of 27 patients and group B, 39 patients. At diagnosis, group A had significantly higher brain natriuretic peptide (BNP), cardiothoracic ratio, PA pressure, and pulmonary vascular resistance index compared with group B. The number of patients with New York Heart Association (NYHA) functional class III and IV was significantly higher in group A than in group B. Cumulative event-free survival rate was significantly lower in group A. Conclusions: MPA dilatation correlated with BNP, NYHA functional class, and hemodynamics with regard to disease severity, and may be a potential prognostic factor in pediatric idiopathic and heritable PAH. Early investigators found significant correlation between MPA/thorax (MPA/T) ratio on chest radiography and PA pressure (PAP).6,7 Although MPA dilation may be a potential risk factor of adverse events in PAH, the clinical impacts of marked PA dilatation have not been fully investigated. The aim of this study was therefore to assess the clinical differences in manifestations, disease severity, vasoreactivity, and outcomes between pediatric PAH with and without marked PA dilatation. Between 1998 and 2013, we enrolled children with idiopathic or heritable PAH who were followed at Toho University Omori Medical Center. Children older than 19 years of age at diagnosis were excluded. The diagnosis of idiopathic and heritable PAH was established according to echocardiography, blood test including autoantibodies and liver function, pulmonary function tests, pulmonary ventilation-perfusion scan, genetic test, and catheterization. We included patients with mean PAP >25 mmHg, with normal PA occlusion pressure ≤15 mmHg on catheterization. In addition, we also included patients with tricuspid regurgitant velocity >3.5 m/s on echocardiography. The healthy control group consisted of 166 age- and gender-matched children. We measured MPA protrusion, which is the distance between the protrusion of the MPA and the vertebral line (A); and thorax diameter (B). MPA/T ratio is expressed as A/B×100 (Figure 1). We used thorax diameter instead of body surface area because of the different physical build. Normal MPA/T ratio was obtained from 166 age- and gender-matched healthy children. To assess the clinical impact of higher MPA/T ratio on disease severity and prognosis, we compared clinical data in patients with higher and lower MPA/T ratio. The MPA/T ratio range in the control group was 4.2–14.2 (median, 7.7), thus, the upper limit of normal MPA/T ratio was defined as 14.2. Group A (higher MPA/T ratio) was thus defined as having MPA/T ratio >14.2, and group B (normal MPA/T ratio) as having MPA/T ratio ≤14.2. We also assessed 6-min walk distance (6MWD), brain natriuretic peptide (BNP), cardiothoracic ratio (CTR), New York Heart Association (NYHA) functional class, and hemodynamic parameters on right heart catheterization at diagnosis. Hemodynamic measurements included right atrial pressure, PAP, pulmonary capillary wedge pressure (PCWP), systemic blood pressure, and oxygen saturation at right heart catheterization. Accordingly, we calculated pulmonary vascular resistance (PVR) index ([mean PAP−PCWP]/cardiac index) and pulmonary vascular resistance/systemic vascular resistance index ratio. Cardiac output was obtained by the Fick method using the LaFarge estimation, and cardiac index was calculated. Composite outcomes included hospitalization due to heart failure, lung transplantation, and cardiac mortality. The Institutional Review Board of Toho University Omori Medical Center approved the study design. Definition of main pulmonary artery/thorax (MPA/T) ratio on chest X-ray in a 12-year-old boy with idiopathic PA hypertension. MPA/T ratio is expressed as the pulmonary artery diameter (A) divided by the thoracic diameter (B)×100. Clinical variables were compared between children with PAH and controls using Student’s t-test for normally distributed data, and Mann-Whitney U-test for non-normally distributed data. Chi-squared test was used to compare primary outcome. The Kaplan-Meier method was used to approximate the adverse events with log-rank test. The association between baseline MPA/T ratio and adverse events was evaluated on univariate Cox proportional hazards analysis. The level of statistical significance was defined as P<0.05. Table 1 lists the clinical characteristics. Overall, 66 PAH patients and 166 healthy controls were enrolled. In the PAH group, median MPA diameter was 31.1 mm. Compared with controls, PAH patients had higher CTR and MPA diameter. 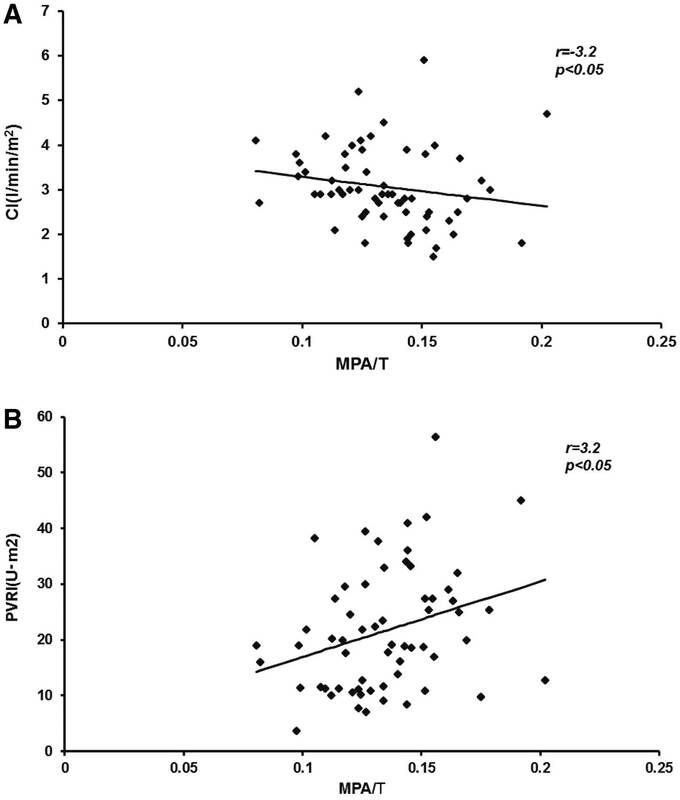 Median MPA/T ratio was 13.4 (range, 8.0–20.0) and 7.7 (range, 4.2–14.2) in the PAH and control groups, respectively (Figure 2). Group A consisted of 27 PAH patients and the remaining 39 PAH patients were in group B. Group A had higher BNP and CTR compared with group B (BNP: median, 141.0 pg/mL vs. 28.9 pg/mL; CTR: median, 54.8% vs. 51.1%, respectively, P<0.05). In addition, the number of patients with NYHA functional class III and IV was significantly higher in group A than in group B (92.6% vs. 64.1%, respectively, P<0.05; Table 2). Data given as median (range) or numbers. CTR, cardiothoracic ratio; MPA, main pulmonary artery; NA, not applicable; PAH, pulmonary artery hypertension. Main pulmonary artery/thorax (MPA/T) ratio in children with pulmonary arterial hypertension (PAH) vs. controls. Data given as median (range), numbers (%) or numbers. 6MWD, 6-min walk distance; BNP, brain natriuretic peptide; CTR, cardiothoracic ratio; ERA, endothelin receptor antagonist; mPAP, mean pulmonary artery pressure; NYHA FC, New York Heart Association functional class; PA, pulmonary artery; PDE5 inhibitor, phosphodiesterase 5 inhibitor; PVRI, pulmonary vascular resistance index; Rp/Rs, pulmonary and systemic vascular resistance ratio; SV, stroke volume. Sixty-one patients (92.4%) underwent heart catheterization. MPA/T ratio had significant, but weak correlations with hemodynamic parameters including PVR index (r=0.32, P<0.05) and cardiac index (r=−0.32, P<0.05), whereas there were no significant correlations between MPA/T ratio and mean PAP and pulmonary/systemic vascular resistance ratio (r=0.21, P=0.09; r=0.23, P=0.08, respectively; Figure 3). Group A had higher mean PAP and PVR index than group B (mean PAP: median, 72.5 mmHg vs. 60.0 mmHg; PVR index: median, 26.2 units·m2 vs. 17.6 units·m2, respectively, P<0.05; Table 2). Correlation of (A) cardiac index (CI) and (B) pulmonary vascular resistance index (PVRI) with main pulmonary artery/thorax (MPA/T) ratio. During follow-up (median, 3 years), 17 of 66 children (26%) had adverse events including hospitalization due to heart failure (n=11) and cardiac death (n=6). None of the patients had lung transplantation. In total, 11 patients in group A (40.7%) had primary outcomes including hospitalization due to heart failure (n=6) and cardiac death (n=5), whereas 6 patients (15.4%) in group B had adverse events including hospitalization (n=5) and cardiac death (n=1). Of the 66 patients, 48 patients had MPA/T evaluation during follow-up (median, 3 years). In group A, 4 of 18 (27.8%) had improved MPA/T ratio (i.e., decrease below upper limit of normal), whereas 4 of 30 in group B (13.3%) had worsening (i.e., increase above upper limit of normal). Three of the 4 patients with worsened MPA/T ratio in group B died during follow-up. Sudden death was noted in 1 patient in group A. None of the patients had coronary compression due to enlarged PA. The MPA/T ratio in patients without adverse events tended to be lower than those in patients with adverse events (median, 12.9; range, 8.2–20.2 vs. 14.4, 8.0–17.8, respectively, P=0.07). The event-free survival rate was significantly higher in group B than in group A (P<0.05, log-rank test; Figure 4). Cox regression models were conducted for the composite outcomes. Patients with higher MPA/T ratio had higher risk of cardiac mortality and hospitalization due to heart failure, although there was no significant difference (HR, 2.7; 95% CI: 0.92–7.81; P=0.07). Cumulative event-free survival rate according to main pulmonary artery/thorax (MPA/T) ratio (group A, MPA/T >14.2; group B, MPA/T ≤14.2). During follow-up, 40.7% of group A had adverse events including hospitalization due to heart failure and cardiac death, whereas 15.4% of group B patients had adverse events including hospitalization and cardiac death. We found that higher MPA/T ratio had a significant correlation with disease severity as reflected by hemodynamic parameters, BNP level, and NYHA functional class, and that it predicted adverse outcome. This suggests that marked dilatation of the MPA is associated with disease progression and worse outcome in pediatric PAH. Several mechanisms are associated with MPA dilatation in severe PAH. PAH is characterized by a complex arteriopathy consisting of intimal thickening and fibrosis, medial hypertrophy and hyperplasia, and adventitial change. Structural changes of elastin and collagen in pulmonary vasculature eventually lead to PA dilatation.8,9 Additionally, altered pulmonary flow under high wall shear stress in the MPA may be associated with progressive PA dilatation. In the present study, children with marked PA dilatation had worse hemodynamic parameters and worse prognosis. Marked MPA dilatation is related to fragmentation of the elastic fibers, leading to PA remodeling and weakening of the vascular wall, and is associated with lower pulmonary compliance.8,9 Pulmonary compliance reflects the distensibility of the PA tree and is a component of right ventricular (RV) workload. 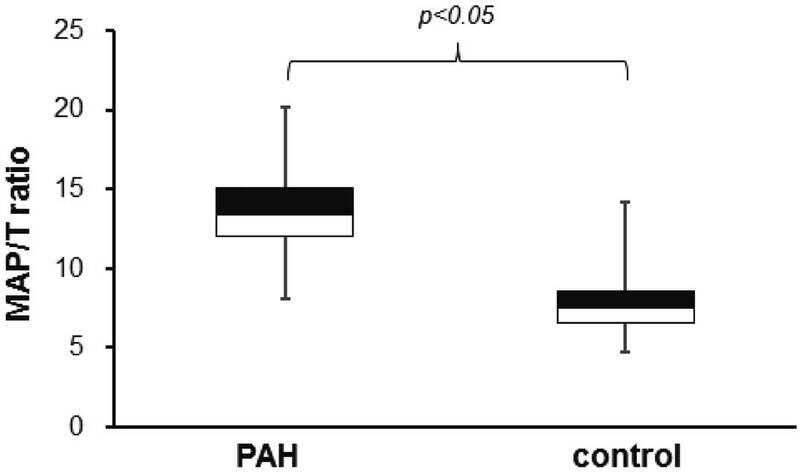 Although normal pulmonary vessels have the capacity to dilate, PA capacity in severe PAH is diminished, leading to increased PAP and RV hypertrophy. As RV hypertrophy progresses, RV diastolic pressure increases and RV failure occurs. RV failure leads to progressive decrease in cardiac output and, eventually, cardiac death. Therefore, ongoing MPA dilatation in severe PAH is a potential risk factor of disease progression. Left coronary artery compression is occasionally caused by enlarged MPA, resulting in ventricular ischemia and fatal arrhythmia.1–3 In this study, none of the patients had obvious coronary ischemia due to PA dilatation, but patients with the progressive PA dilatation should be monitored for ischemic change and ventricular arrhythmia on routine electrocardiogram. PA dilatation is a potential risk factor for cardiac mortality in adult PAH.1–3 Adult studies have reported a weak correlation between PA dilatation and PAP.6,10,11 Similarly, in pediatric patients, PA dilatation had a weak correlation with PVR index and cardiac index. Additionally, MPA dilatation had similar clinical impacts on cardiac mortality both in adult and pediatric PAH, therefore structural change of the pulmonary vasculature may be an indicator of high risk of poor prognosis in PAH, regardless of age. There are no studies, however, on the clinical impact of PA size on outcome in pediatric patients. Most importantly, we found that PA size on chest X-ray could predict adverse events in pediatric PAH. 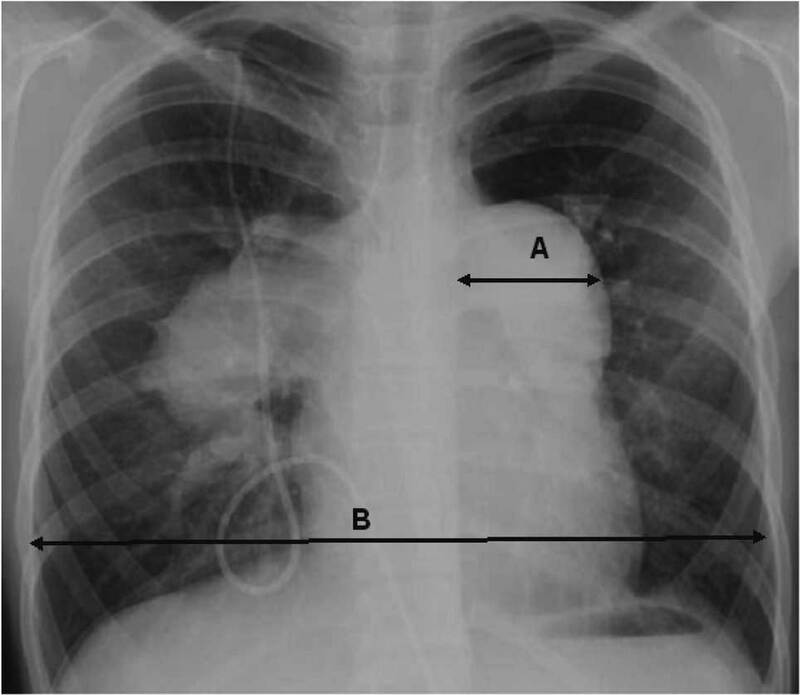 Currently, computed tomography (CT) is used to evaluate PA diameter in PAH.11,12 Single CT, however, carries a risk of exposure to radiation compared with conventional X-ray. Thus, CT is not acceptable for routine clinical use for serial assessment of PA size. In contrast, chest X-ray is easier, and can be used to assess PA dilatation at outpatient clinics, and is available during routine clinic visits. Additionally, previous adult studies evaluated the clinical association of PA diameter with various forms of PAH, including chronic thromboembolic pulmonary hypertension, and PAH due to connective tissue disease.1,13 Although secondary PAH is common in adults, PAH due to connective tissue disease and chronic thromboembolic pulmonary hypertension is uncommon in children. The etiologic difference may influence the characteristics of the pulmonary vasculature. Therefore, this is the first report to describe the correlation of PA dilatation with disease severity and outcome in pediatric idiopathic and heritable PAH. Several limitations should be mentioned. This study was limited by relatively small numbers. Therefore, a larger study involving children with idiopathic or heritable PAH is needed to determine whether the present results can be generalized to the larger population. This was a retrospective, observational study using routinely collected data from patients at a single center. Additionally, confounding factors that we could not adjust for, are a potential source of outcome bias. For example, the targeted therapies may be associated with adverse outcomes. Despite these limitations, this study has described an association between PA trunk dilatation and clinical characteristics; and shown that PA dilatation on single, non-invasive, chest X-ray can be used to evaluate disease severity and prognosis in children with idiopathic and heritable PAH as a homogeneous group. PA size on chest X-ray may be a useful prognostic factor in pediatric idiopathic and heritable PAH. Given, however, that there are no studies on the relationship between chronological change in PA size after vasodilator therapy and outcome, further studies are needed. All authors do not have any honorariums, grants, or other form of payments from pharmaceutical company and industry and have no conflicts of interest to disclose. T.S. belongs to Department of Advanced Cardiovascular Research; Toho University contracts with Actelion Japan. 1. Żylkowska J, Kurzyna M, Florczyk M, Burakowska B, Grzegorczyk F, Burakowski J, et al. Pulmonary artery dilatation correlates with the risk of unexpected death in chronic arterial or thromboembolic pulmonary hypertension. Chest 2012; 142: 1406–1416. 2. Demerouti EA, Manginas AN, Athanassopoulos GD, Karatasakis GT. Complications leading to sudden cardiac death in pulmonary arterial hypertension. Respir Care 2013; 58: 1246–1254. 3. Albadri K, Jensen JM, Christiansen EH, Mellemkjær S, Nielsen-Kudsk JE. Left main coronary artery compression in pulmonary arterial hypertension. Pulm Circ 2015; 5: 734–736. 4. Tang BT, Pickard SS, Chan FP, Tsao PS, Taylor CA, Feinstein JA. Wall shear stress is decreased in the pulmonary arteries of patients with pulmonary arterial hypertension: An imagebased, computational fluid dynamics study. Pulm Circ 2012; 2: 470–476. 5. Schäfer M, Ivy DD, Barker AJ, Kheyfets V, Shandas R, Abman SH, et al. Characterization of CMR-derived haemodynamic data in children with pulmonary arterial hypertension. Eur Heart J Cardiovasc Imaging 2017; 18: 424–431. 6. Lupi E, Dumont C, Tejada VM, Horwitz S, Galland F. A radiologic index of pulmonary arterial hypertension. Chest 1975; 68: 28–31. 7. Kanemoto N, Furuya H, Etoh T, Sasamoto H, Matsuyama S. Chest roentgenograms in primary pulmonary hypertension. Chest 1979; 76: 45–49. 8. Lammers SR, Kao PH, Qi HJ, Hunter K, Lanning C, Albietz J, et al. Changes in the structure-function relationship of elastin and its impact on the proximal pulmonary arterial mechanics of hypertensive calves. Am J Physiol Heart Circ Physiol 2008; 295: H1451–H1459. 9. Badagliacca R, Poscia R, Pezzuto B, Papa S, Nona A, Mancone M, et al. Pulmonary arterial dilatation in pulmonary hypertension: Prevalence and prognostic relevance. Cardiology 2012; 121: 76–82. 10. Boerrigter B, Mauritz GJ, Marcus JT, Helderman F, Postmus PE, Westerhof N, et al. Progressive dilatation of the main pulmonary artery is a characteristic of pulmonary arterial hypertension and is not related to changes in pressure. Chest 2010; 138: 1395–1401. 11. Devaraj A, Hansell DM. Computed tomography signs of pulmonary hypertension: Old and new observations. Clin Radiol 2009; 64: 751–760. 12. Caro-Domínguez P, Compton G, Humple T, Manson DE. Pulmonary arterial hypertension in children: Diagnosis using ratio of main pulmonary artery to ascending aorta diameters determined by multi-detector computed tomography. Pediatr Radiol 2016; 46: 1378–1383. 13. Grubstein A, Benjaminov O, Dayan DB, Shitrit D, Cohen M, Kramer MR. Computed tomography angiography in pulmonary hypertension. Isr Med Assoc J 2008; 10: 117–120.